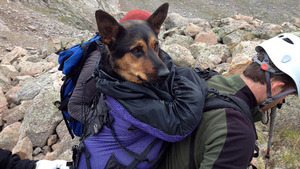 Husband-and-wife hikers Scott and Amanda Washburn were making a trek up a Colorado mountain August 11 when they found something that they never expected to find: Missy, a German Shepherd, abandoned on the mountain’s dangerous peak. Missy, a German Shepherd dog who was abandoned on a Colorado mountain, is brought to safety. Seeing the extent of Missy’s injuries, the concerned couple attempted to persuade the German Shepherd to follow them off of the mountain, but the dog was too exhausted and dehydrated to move much less make the descent from a 14,000-foot mountain. And at over 100 pounds, the Washburns knew that they would not be able to carry the injured dog down to safety on their own. Using their first aid kit, Amanda and Scott did their best to bandage as many of the dog’s wounds as they could. Leaving Missy with food and water on the flattest rock they could find, the Washburns made their way down Mount Bierstadt, searching for help in their efforts to rescue the dog. The couple ran into a Forest Service ranger on their way to the base of the mountain, but the ranger explained that the agency could not assist them in the rescue of a German Shepherd. “My wife broke down crying at the thought of leaving the dog to die,” Scott said. Desperate to save the dog they had found, Scott and Amanda took to the web to organize a search and rescue party. On the mountain climbing and hiking forum 14ers.com, the Washburns posted a description of where they’d found Missy along with a couple of photographs they had taken of the stranded female German Shepherd. A group of experienced hikers took to the peak the following day, but could not find Missy. When Scott Washburn and a second party of hikers ascended Mount Bierstadt Monday, battling through a fierce snowstorm, they spotted the dog cowering behind a rock on Sawtooth Ridge, her wounds reopened. The team was able to carry a badly injured Missy down the mountain and to safety by placing her in a climber’s backpack. Washburn transported the Shepherd to a local veterinarian, who explained that Missy is a miracle dog because she suffered no lasting damage from her ordeal. In all, Missy spent 8 days alone on Mount Bierstadt. Missy’s owner, Anthony Ortalani, has since come forward, hoping to reclaim the dog that he left on Mount Bierstadt. Ortalani explained that Missy accompanied him on a hike August with a more inexperienced hiker, and that Missy’s paws became so torn up on the rocks that she was unable to walk. When a storm seemed imminent, Ortalani was forced to leave Missy on the mountain. Scott and Amanda Washburn, along with the rest of the team that rescued Missy, want to adopt the German Shepherd. “I just don’t think that his actions have shown that he is a responsible dog owner,” Scott Washburn told ABC News of Ortalani. “We understand that he had to leave her there. My wife and I did the same thing. But we ended up going back for her, and we went to some pretty extreme lengths to do so,” he added. Missy remains at the veterinarian’s office until she fully recovers. She will then be transferred to the Clear Creek County Sheriff’s Office pending an investigation.